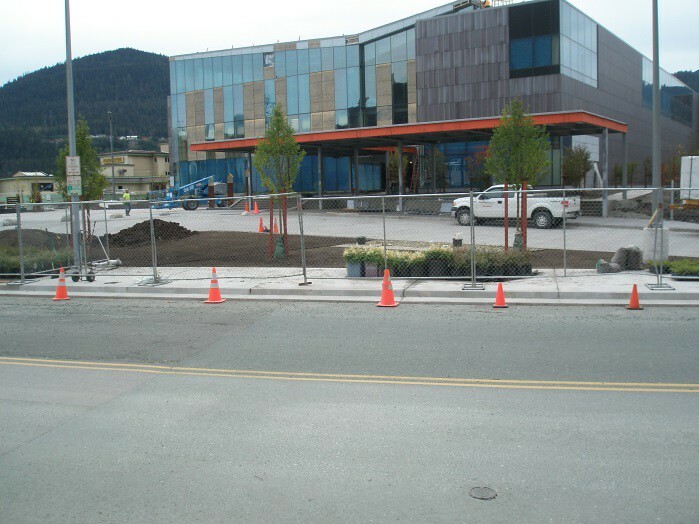 PDC Engineers (previously R&M Engineering) was selected to provide geotechnical engineering services for the State of Alaska Library, Archives and Museum (SLAM) project in Juneau, Alaska as a sub-consultant to ECI/Hyer Architects. The project sits on approximately 3 acres of land that was originally developed during the early 1900’s gold mining era. The existing Alaska State Museum was demolished for the construction of the new SLAM building. The SLAM building has two floor levels with a level below grade for 62 parking stalls and mechanical space. The first floor is allocated mainly for the Museum exhibit and a secure storage area with loading dock as well as a lobby and combination of service rooms and offices. The second floor has another secure storage area similar to the first floor, a library, and combination of several offices. The building has approximately 64,000 square feet of footprint area. The below grade parking covers approximately 53,500 square feet area of the total building footprint area. The scope of services we provided consisted of geotechnical analysis, evaluation and design recommendations related to the preparation of the building foundation, floor slabs, driveway access lanes, hardscape areas and bus parking lanes. PDC conducted a site reconnaissance and explored subsurface conductions by collecting samples using our in-house CME-55 truck mounted drill. 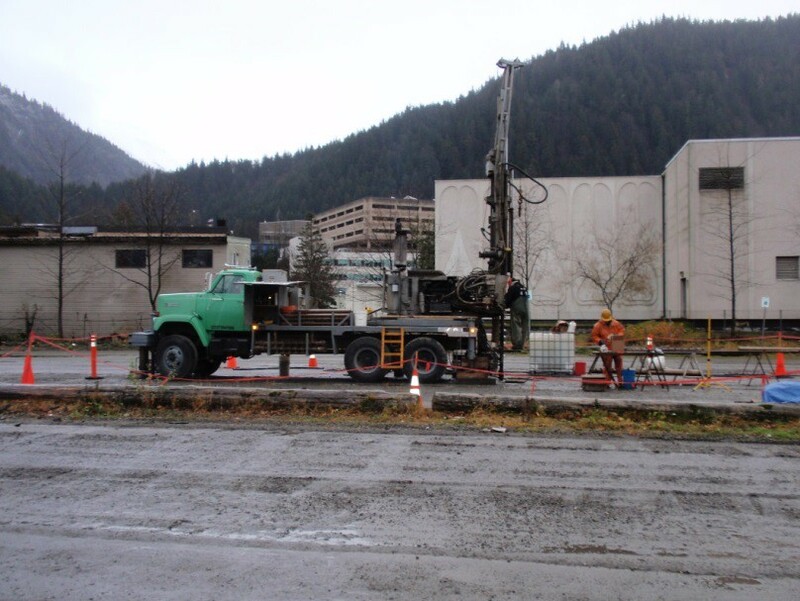 Seven (7) drill test holes were performed at varying depths from 20’ to 75’ below the ground surface. Test holes were advanced using a combination of an 8” solid-stem auger boring, wash boring, and rotary drilling to the maximum target depth. Drilling thru coarse gravel and cobbles/boulders was advanced by rotary drilling methods. Tricone and impregnated diamond bits were utilized to advance and drill through the coarse gravel or boulder formations. Rotary drilling method was performed to crush the coarse gravel or cobbles into very small pieces. Coring procedure used a wireline “NQ” double tube core barrel, yielding 2-1/4” (57mm) rock sample, was utilized to advance thru the cobble/boulder formation. When ordinary wash boring method or rotary drilling was ineffective in advancing the borehole due to large particle size or caving-in of the borehole, biodegradable bentonite mud was used to stabilize the sidewalls of the borehole. Soil samples were obtained at frequent intervals and selected representative samples to be tested in PDC’s in-house laboratory. Samples collected were analyzed for pertinent physical and engineering properties of the soil relative to the proposed construction. Three (3) standpipe piezometers were installed and ground water levels monitored during the pre-design phase as the site was under tidally influenced conditions. 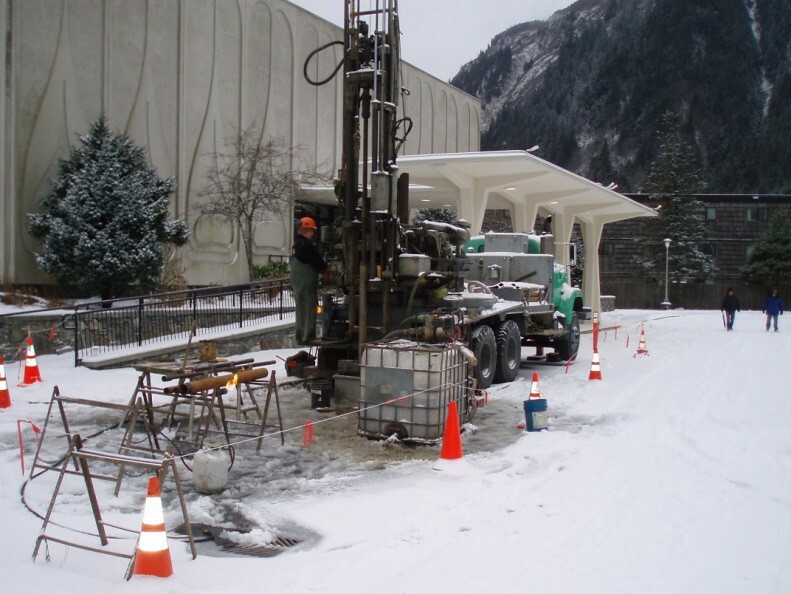 The geotechnical report included ground motion analysis, allowable bearing capacity and settlement analysis, retaining wall/basement load factors, dewatering, frost protection, building site preparation, parking/access preparation, underground site utilities and corrosion resistant construction recommendations. PDC performed periodic Special Inspection services for monitoring the building foundation excavation, proof rolling and structural fill placement beneath the building.